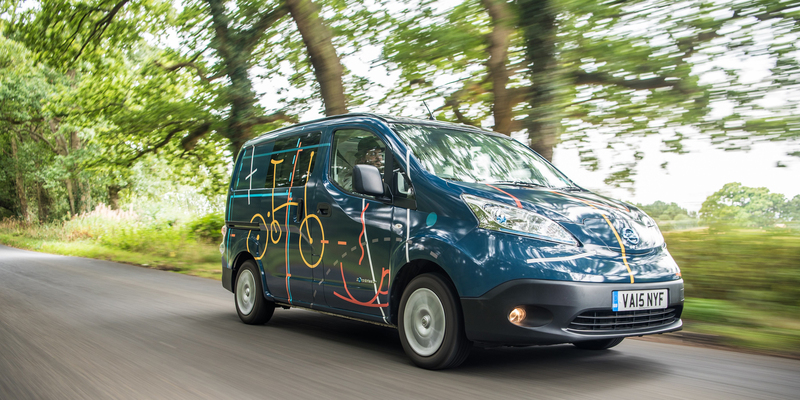 nissan e NV200 WORKSPACe electric mobile office: the japanese-automaker has collaborated with UK-based design workshop studio hardie to transform its zero emission ‘e-NV200’ van into the world’s first all-electric mobile office–the ‘e-NV200 workspace’. 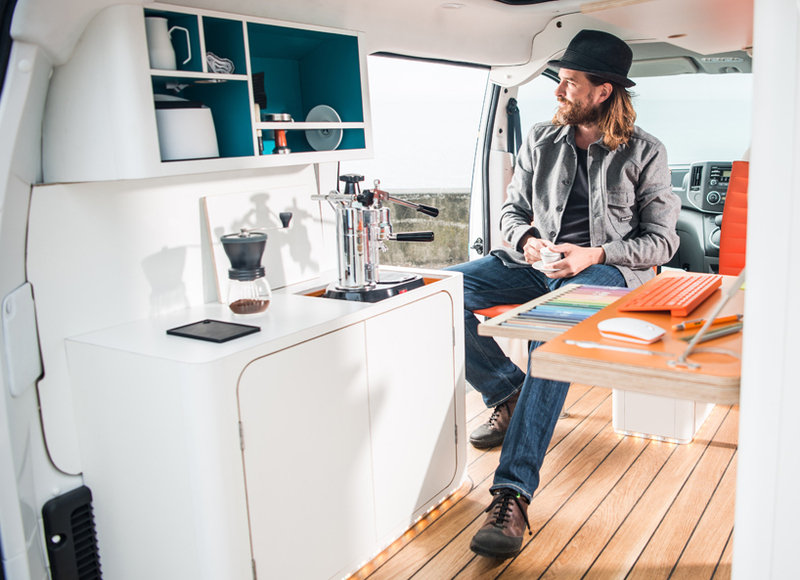 this professional office environment on wheels features an integrated fold-out desk; touchscreen computer; wireless internet; wireless phone charging; bluetooth audio system; smartphone-controlled LED lights; mini fridge; and barista-quality coffee machine. 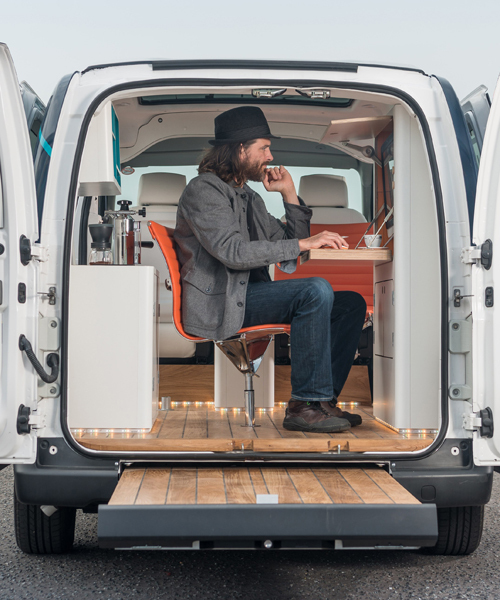 the nissan ‘e-nv200’ workspace concept not only highlights the customizable potential of its electric van, it paints a picture of what desk-based employment could look like in the future as ‘hot-desking’ and flexible working grows in popularity across the globe. 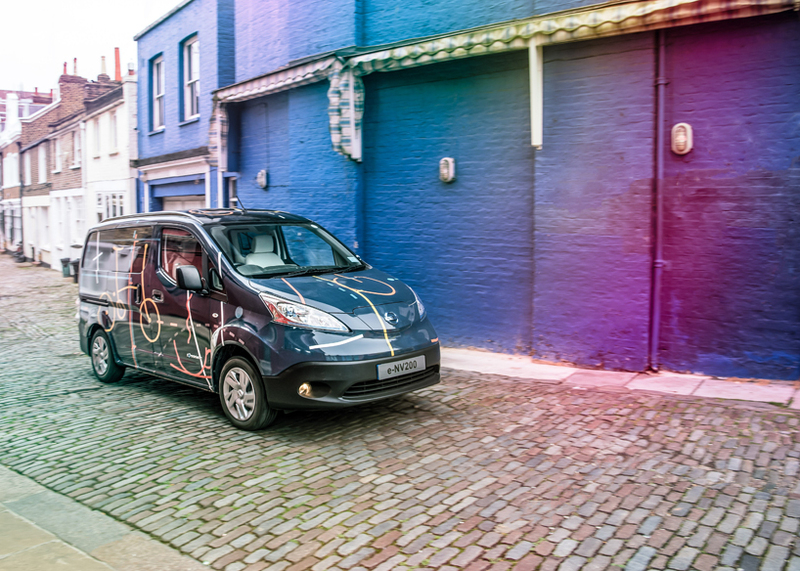 moreover, the one-off vehicle also provides an example of the nissan’s intelligent mobility vision, and its view of how the relationship between vehicles and people are changing. during 2015, the number of co-working and hot-desking spaces worldwide increased by 36 percent as small businesses and working professionals looked for increased mobility and a more cost-effective alternative to traditional city-centre office space. 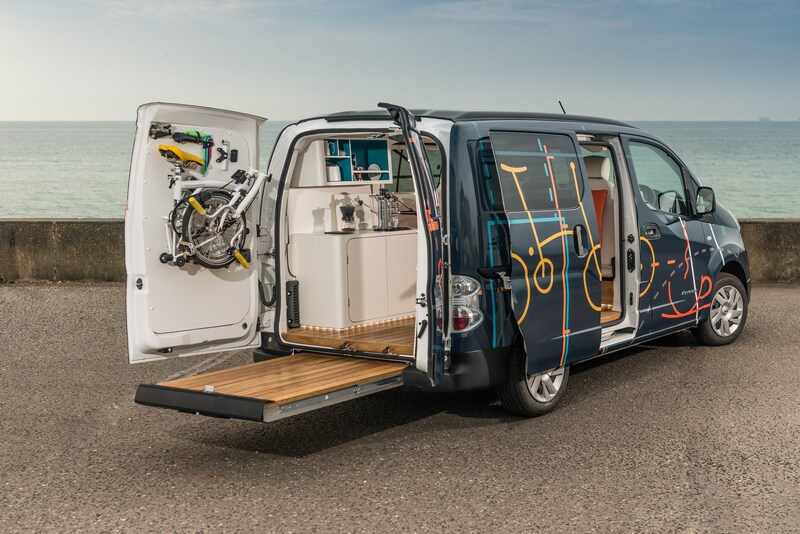 stepping inside the best-in-class 4.2m³ load bay of the ‘e-nv200’ workspace, occupants are welcomed into a bright working environment with a special panoramic glass roof and LED floor lighting enhancing the feeling of space. the intelligent system can also be customized to whatever color scheme the user desires by connecting with a smartphone app to adjust the lighting based on a large number of parameters, such as the palette within a photo. bright dashes of colored trim and a premium-feel, decked oak flooring complete the contemporary ambience. 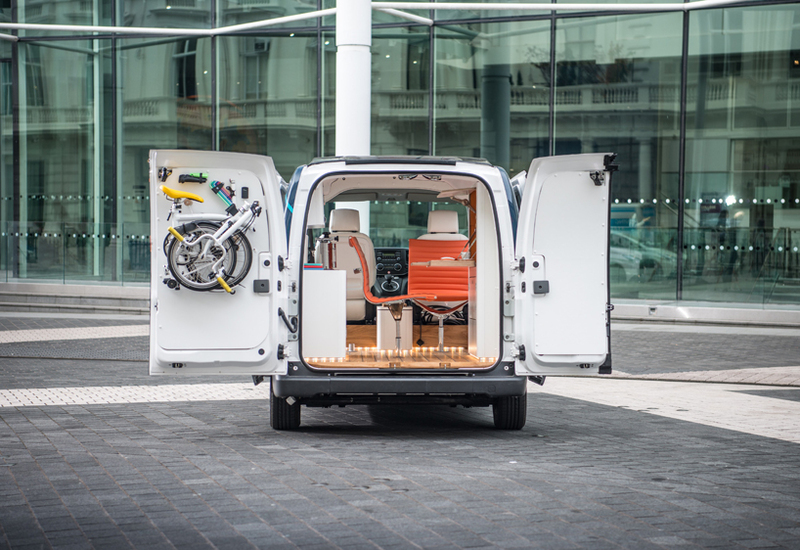 the front seats have also been reupholstered in white to carry the design theme from the rear of the van through to the cockpit. if the weather is fine, both side sliding doors can be opened, together with the split rear doors, to create a more open working atmosphere. at the rear, a clever floating deck can be pulled out to provide an outdoor area from which to take a phone call, work from a laptop or just admire the view of your surroundings. 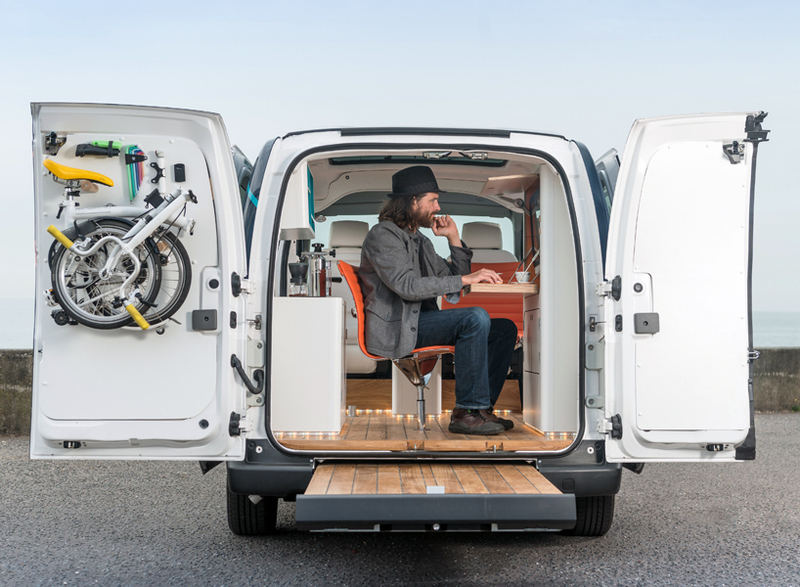 inside the ‘e-NV200’ workspace are two chrome and leather desk chairs, anchored to the van’s oak flooring on custom mounts. in one configuration these are positioned side-by-side to allow for two people to have a meeting. 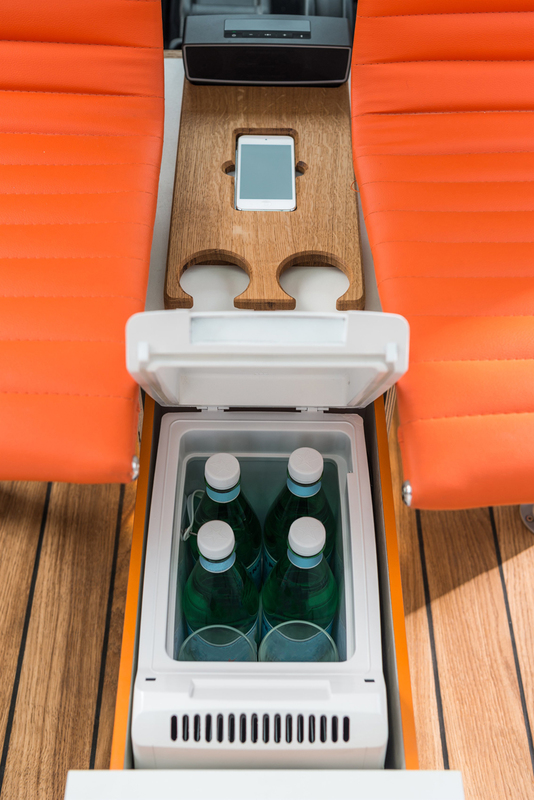 between these chairs is a wooden console containing a wireless charging dock for smartphones; bluetooth music speaker; and a drawer-based mini-fridge. one of the chairs can then be moved to a central mounting point, allowing a user to sit at the fold-down desk console, which houses a touch-screen computer; wireless mouse; and keyboard; plus an array of stationary supplies, each with its own storage space. on the other side of the load bay is a console designed for making barista quality coffee. 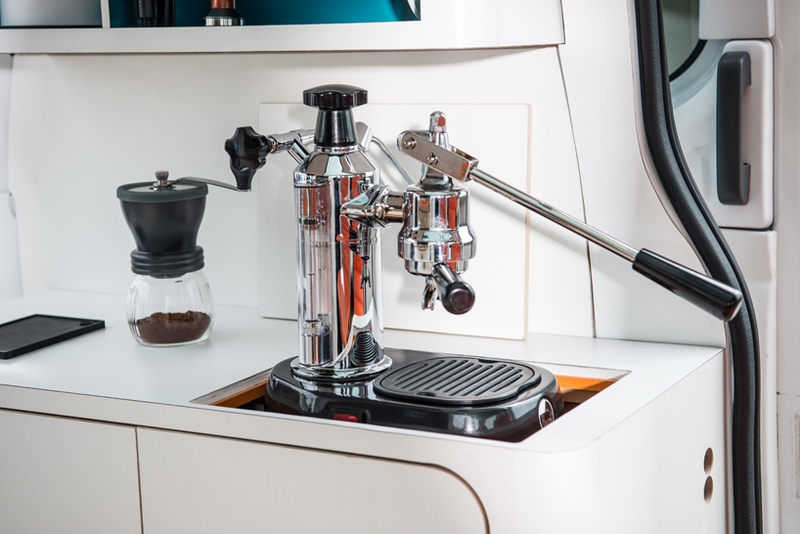 a barista quality coffee maker rises mechanically from a concealed compartment within the counter with a full array of coffee-making equipment, stored in the overhead locker, for crafting the perfect espresso or cappuccino. 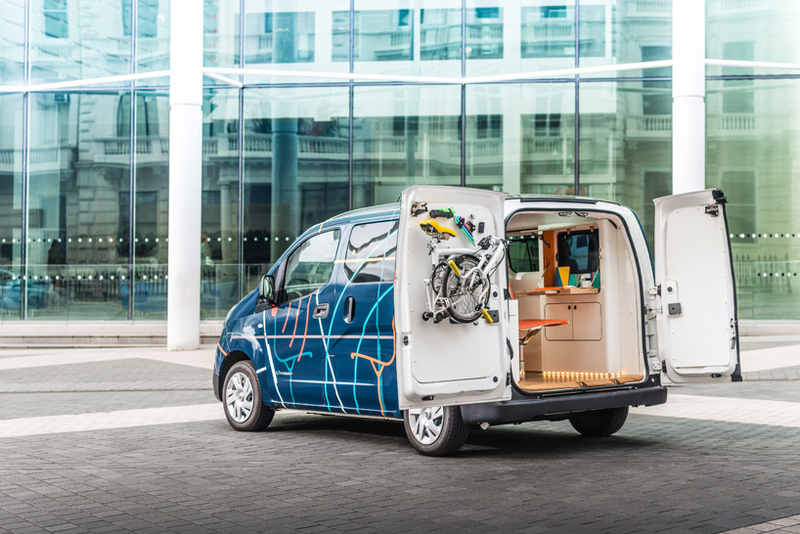 with electric vehicles costing as little as €0.03 per kilometre to run, the ‘e-nv200’ workspace offers a cost-effective desk space solution allowing users to work for free in some city-centers that offer free EV charging bays, or escape the city altogether for the countryside or coastal fresh air. 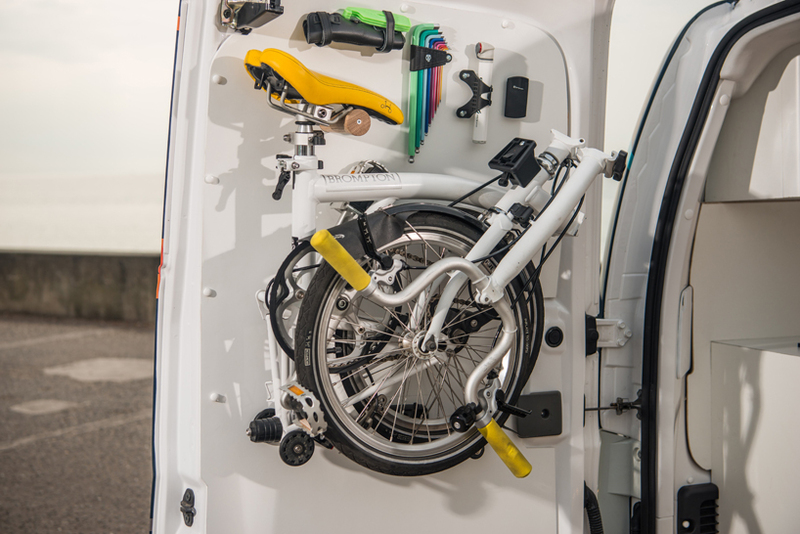 the ‘e-nv200’ can be rapid charged from empty to 80 percent power in just 30 minutes, and for those times when you want to leave the office parked and charging up, there’s an internal mount for a folding brompton bike, allowing users to make short trips around the city or complete the ‘last mile’ of any journey.